If a grand entrance with a bird straight out of a Norman Rockwell painting is not part of your Thanksgiving ritual, you can cut cooking time substantially by butterflying the bird, and giving the roasting a juicy jump-start under the broiler. This is an especially good method if you prefer to bring platters of carved meat to the table, or are setting a buffet. This method of roasting uses the high broiler heat to sear and brown the skin, sealing in the meat’s juices. You start by laying out the butterflied bird, skin side down in a shallow roasting pan, basting it generously with melted, rendered duck fat, and then position the bird so the meat is 7 or 8 inches from the preheated element. Broiling uses intense heat, so if your oven has only one broiler setting that temperature is likely a whopping 550°F. If you can thermostatically control your broiler, set the temperature between 350°F and 400°F. You want a slower searing than is usually gotten by broiling, say about 16 to 18 minutes or so on the first side, so adjust the broiler heat accordingly. In either case, watch the bird carefully, and baste frequently during this process. Once the meat has browned nicely, take it out of the oven to season with a good salt, and turn the bird skin side up. Baste the skin and place the turkey back under the broiler. The skin side can burn easily, so continued vigilance and basting is required. This side will be under the broiler for about 10 to 12 minutes, give or take. This is really about browning, not a desired degree of doneness, so it is more of a visual judgment than precise timing. Once the skin has browned nice and lightly, you remove the bird from beneath the broiler, and change it out to an oven that has been preheated to 350°F, be it the same oven or another. The roasting process now begins. 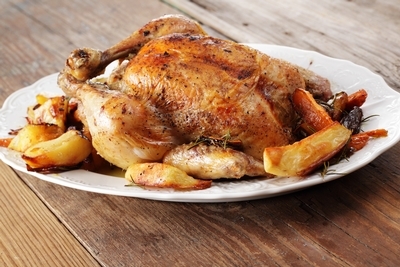 Unlike roasting an intact bird, you roast a butterflied bird in the middle level of the oven. You will still want to baste every 20 minutes or so for the duration of the roasting time. Use the melted duck fat until the bird produces enough of its own pan drippings for basting. Using this method, a 15-pound turkey should only take about 1-1/2 to 2 hours to finish cooking. Ultimately, you want an internal temperature of 165°F. Next Post Super Easy Thanksgiving Canapés!